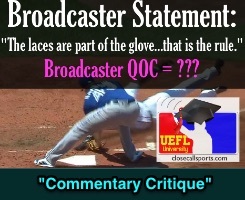 Welcome to the inaugural episode of Commentary Critique, where we take a broadcaster's statement and analyze the announcer's rules- or umpire-centric accuracy. Today, we see if Toronto's "the laces are part of the glove...that is the rule" is a correct statement or not. Just as we determine Quality of Correctness for an umpire who ejects a player, we will attribute a Broadcaster QOC for this corner of criticism. Question: Are laces part of the glove? The Play: With two out and a runner on third, Blue Jays pitcher Sam Gaviglio's 2-2 slider to Red Sox batter Xander Bogaerts bounced in the dirt and eluded Jays catcher Luke Maile, who threw to Gaviglio covering home as Red Sox baserunner R3 Jackie Bradley attempted to score. The Call & Challenge: Initially ruled safe by HP Umpire Jerry Layne, the ruling was overturned to an out after John Gibbons challenged the call. Commentary Critique, Statement: During the Replay Review, Blue Jays broadcasters Buck Martinez and Dan Shulman stated that because the laces of Gaviglio's glove made contact with Bradley's hand, the runner was out. According to Shulman, "the laces are part of the glove...that is the rule." Commentary Critique, QOC: This statement is inaccurate (QOCN). While the laces are physically attached to the glove, loose/hanging laces alone tagging a runner is not sufficient for an out call. A TAG is the action of a fielder in touching a base with his body while holding the ball securely and firmly in his hand or glove; or touching a runner with the ball, or with his hand or glove holding the ball (not including hanging laces alone), while holding the ball securely and firmly in his hand or glove. OBR Appendix 4: Laces are not part of a glove. Analysis: Accordingly, laces alone are not sufficient for a tag and the broadcasters' statement otherwise ("that is the rule") is incorrect. This phrase—"not including hanging laces alone"—was added to the Official Baseball Rules ahead of the 2016 season, as the Rules Committee was concerned with expanded replay and potential confusion of whether a hanging lace incidentally contacting a runner should be enough to oblige the Replay Official to overturn a safe call or confirm an out call. 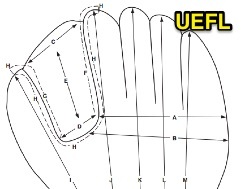 This is also supported by OBR Diagram 4, in Appendix 4, which pictures a regulation glove featuring many items of interest, none of which happen to be hanging laces. Instead, the call in Boston was overturned to "out" because the fielder tagged the runner, not with hanging laces, but with the glove's web, as indicated by Diagram 4's letter "E" (and C, and D).